FREE! DNA Buying Guide – download your copy HERE! National DNA Day Sales Have Started! 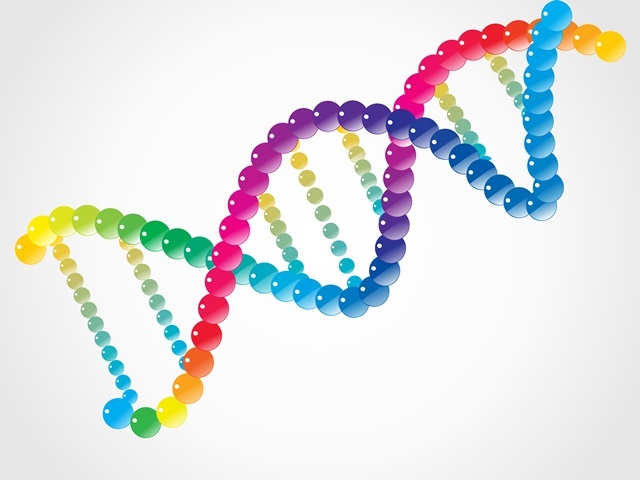 National DNA Day is Wednesday, April 25th, but the sales celebrating the anniversary of the day the DNA discovery was announced in 1952 are already in full swing! Check out our sister sites DNA Bargains and National DNA Day for the latest information! And don’t forget to read our recent post “National DNA Day 2018 Forecast: HOT HOT HOT and Health Warms Over” which offers solid advice on getting the right DNA test for the best price! IMPORTANT! 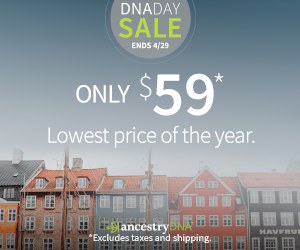 ANCESTRY MEMBERS and PREVIOUS ANCESTRY DNA CUSTOMERS: Current Ancestry members who are logged in, and who have already done a DNA test with Ancestry will see the price appear as $79 USD! Here is the workaround: click on the banner ad that appears at the top of the page – you should see the $59 USD price! Click HERE then wait for the $59 USD banner ad to appear to get the $59 USD sale price! NEW! 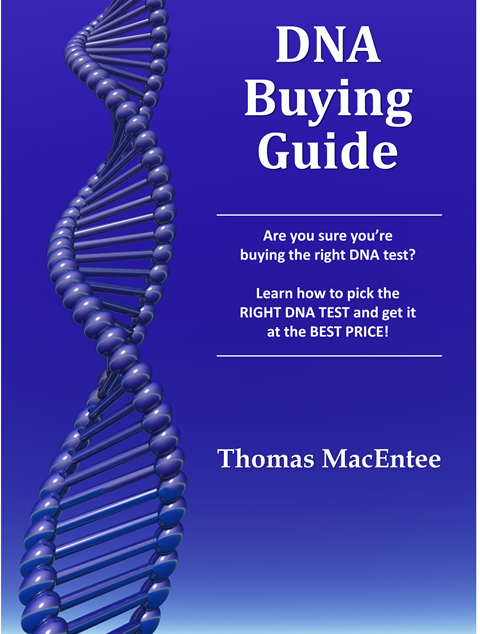 FREE DOWNLOAD – DNA Buying Guide by Thomas MacEntee – If you are planning on purchasing a DNA test kit for yourself, as a gift, several tests for family members, or have a specific testing need, DNA Buying Guide provides you with the best strategy as you navigate all the different sales offers on DNA test kits and related genetic genealogy products. Which DNA test kit should you purchase? Should you buy now or wait for an upcoming sale? Which DNA testing companies are the best? Is there a difference? What type of DNA test should you purchase? Which is the best DNA test kit to purchase? DNA Buying Guide also covers Other Factors in Choosing a DNA Test Kit and provides a Resource List with over 100 tools and sites get the most out of your DNA testing experience. Click HERE to download for FREE! NEW! 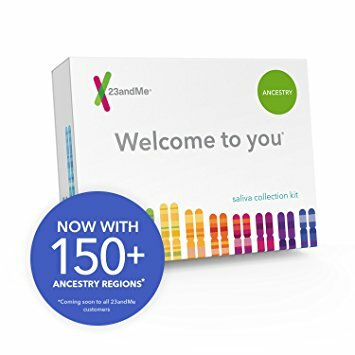 Save 30% on all DNA tests at 23andMe! There is a HUGE SALE going on at 23andMe for National DNA Day! We didn’t even see prices this low during Black Friday 2017 so this is pretty amazing! The Ancestry Service test kit (autosomal DNA test, compare to AncestryDNA), regularly $99 USD, is now just $69 USD! The Ancestry Service + Health test kit, which also provides health information based on DNA, regularly $199 USD, is now just $139 USD! Offer open to US and Canada residents. Sale valid through April 25th. Click HERE to shop – via 23andMe. Want to save money and get 23andMe at the same National DNA Day Sale prices PLUS FREE One-Day Shipping? If you have an Amazon Prime membership, click HERE and order your test through Amazon! NEW! Family Finder just $49 USD and save up to 40% on other DNA test kits at Family Tree DNA! Family Tree DNA is holding an AMAZING National DNA Day Sale with some SWEET prices on DNA test kits and bundles! DNA Test Kit Bundles On Sale! mtFull Sequence: Examines all regions of mtDNA, identifying your maternal haplogroup and migration path. Regularly $199, now just $146! Save $50! Big Y-500 Test *: Tests 500 markers. Explore your paternal lineage and follow the ancient migration path of your male ancestors. Regularly $799, now just $649! Save $150! Family Finder + Y-37 Test Bundle*: Our Family Finder + Y-37 bundle allows you to explore your deep paternal ancestry and migrations. Regularly $248, now just $179! Save $69! Family Finder + Y-67 Test Bundle*: Allows you to explore your deep paternal ancestry and migrations and all that Family Finder has to offer. Regularly $347, now just $249! Save $98! Family Finder + mtFull Sequence Test Bundle: Allows you to explore your deep maternal ancestry and migrations and all that Family Finder has to offer. Regularly $278, now just $189! Save $89! NEW! 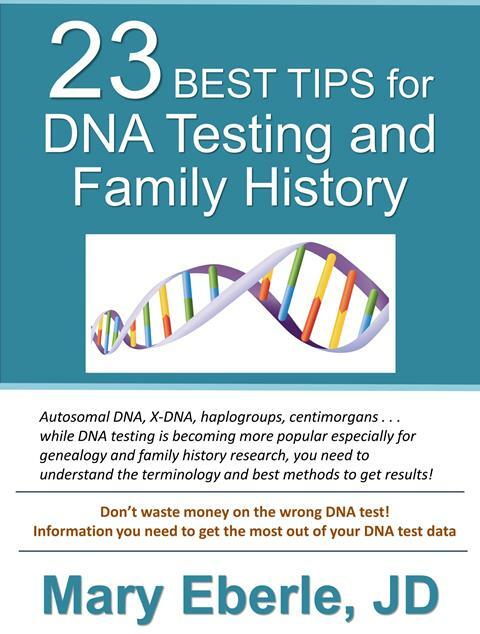 Save 40% on 23 Best Tips for DNA Testing and Family History by Mary Eberle, JD. Release in November 2017, there is a huge price drop at Amazon PLUS this ebook is now available in PDF format at the same discount! Regularly $4.99 USD, now just $2.99 USD! Click HERE for the Amazon Kindle version and click HERE for the PDF version. 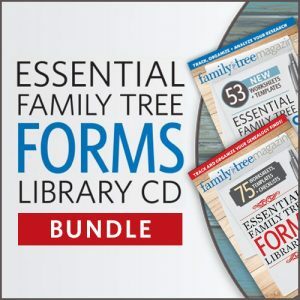 Essential Family Tree Library CD Bundle: Don’t lose track of your family discoveries! Use the genealogy worksheets, templates and checklists on these CD’s to organize your family facts and keep tabs on your progress. You’ll boost your productivity with these genealogy forms at your fingertips! Or get the same bundle as a download! Regularly $44.98, now just $32.99! Click HERE for the CD version and click HERE for the download version. 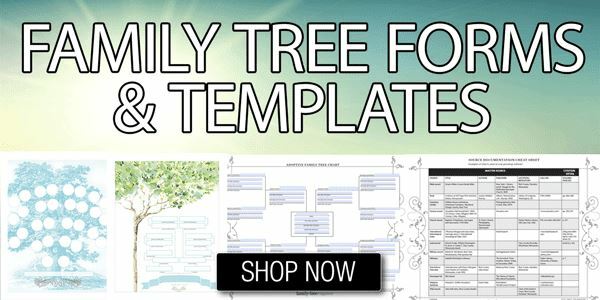 Ultimate Genealogy Templates Bundle: After you’ve learned the format of standard genealogy charts and worksheets, you’ll see why generations of genealogists have found them so handy. They’re the ultimate organizational tools, from research logs to binder templates and recipe cards. 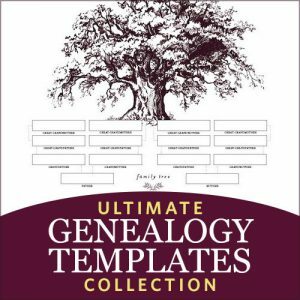 With the Ultimate Genealogy Templates Collection, you’ll have your hands on a wealth of useful family history forms that you’ll soon be filling out like a pro. Regularly $168.99, now just $49.99! Click HERE to shop. MyHeritage DNA – just $69 USD! For just $69 USD you can get the popular autosomal DNA test kit similar to AncestryDNA, Family Tree DNA and other DNA testing companies. You’ll have access to more ethnicities than any other major vendor PLUS received your results much faster than other companies. Note: you must purchase two (2) or more MyHeritage DNA test kits for this special price! Regularly $99 USD, now just $69 USD! Click HERE to shop – via Amazon! Each digital download consists of two 90-minute recorded webinars, with Q&A periods, PLUS extensive handouts. IMPORTANT: You must use promo code DNADAY18 at checkout to claim your 50% savings! 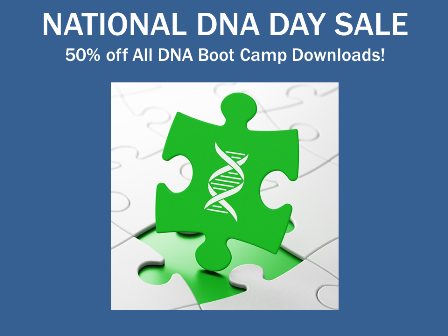 Visit the DNA Boot Camp Digital Downloads page at Hack Genealogy for more information – click HERE! Save an Additional 20% on Living DNA – only $79 USD! The National DNA Day Sales are starting with Living DNA the first of the Big 5 DNA testing companies to announce a HUGE SALE! Living DNA is the world’s most advanced DNA test, offering twice the detail of other ancestry tests. Why take a Living DNA test? Twice the detail of other ancestry tests: We give you your DNA mix across 80 world regions, including 21 in Britain and Ireland. You can also explore peer reviewed details of the areas of the world your ancestors are from. 3-in-1 ancestry test: Our test not only covers your family line ancestry, but unlike other tests we also include your motherline, and your fatherline ancestry if you are male. View your ancestry through history: We put your ancestry into context showing your breakdown today (going back up to 10 generations), and also the spread of your ancestors at different points in history, showing how we are all connected. Your ancestry results updated for free: As science and our systems evolve, your results will be updated to provide on-going details about your ancestry. 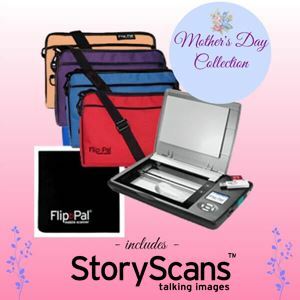 FREE SHIPPING plus Sale on Mother’s Day Collection mobile scanner bundle at Flip-Pal Mobile Scanner! “We have assembled an affordable collection of items that are a perfect gift for mom and grandmom and priced at $15.00 less than if the items were purchased separately!